LAS VEGAS – Julio Cesar Chavez Jr. would be the WBC middleweight champion today had he a sense of humility and shown respect for the sport that made him rich and famous. He wouldn't have been embarrassed for 11-plus rounds by Sergio Martinez had he acted like the professional he supposedly is. Chavez, the eldest son of the greatest athlete in the history of Mexico, lived for years in the enormous shadow cast by his father. He picked the wrong time to try to step from the shadow and be his own man. He lost a lopsided unanimous decision to Martinez Saturday, getting easily outboxed, before a crowd of 19,186 that sounded like it was at least double that number. Judges Adalaide Byrd and Dave Moretti scored it 118-109 for Martinez, the same as Yahoo! Sports, giving the Argentinian the first 11 rounds. Judge Stanley Christodolou had it 117-110, giving Chavez only the sixth and the 12th. The prefight rumors that Chavez wasn't training properly and was working in his living room instead of the gym were denied vehemently by all associated with his team. The rumors, though, turned out to be correct, as well as Chavez's undoing. 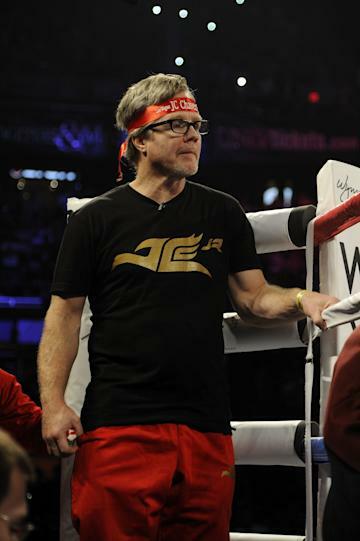 "Overall, we didn't work hard enough for this fight," Freddie Roach exclusively told Yahoo! Sports following the fight. "Living rooms are overrated. Boxing gyms are there for a reason. I'll work with him again. First day he misses [coming to] the boxing gym, I'll go home." Roach said Chavez Sr. was so frustrated by his son's training situation that he twice left camp. Sean Gibbons, who was working with Chavez, said before the bout Saturday that Chavez worked hard, but did things the way he wanted to do them as he tried to forge his own identity. Promoters Lou DiBella and Bob Arum as well as HBO Sports executives were immediately pushing a rematch because of the 12th-round drama. In the final minute of the fight, Chavez landed a crushing straight right hand that wobbled Martinez. Chavez sensed that this could be his big moment and pounced. A little more than 22 years ago, just up the street, Chavez Sr. staged a dramatic 12th-round rally to stop Meldrick Taylor in one of the most memorable fights of the 20th century. On Saturday, the son nearly pulled off the family daily double of dramatic late finishes. When he saw how badly hurt Martinez was, he rushed him and landed three consecutive left hooks. Just a few feet away, DiBella, who lives and dies with the fortunes of his fighters, felt like he might get ill.
"I was sweating through my clothes," DiBella said. Martinez was clearly buzzed after he took the count from referee Tony Weeks and it seemed unlikely he would be able to make the finish. His inclination to fight, to try to put on a show even when it wasn't the prudent move, is why DiBella believes he'll vault into superstardom. "Chavez is a warrior and that last round was great stuff," DiBella said. "I don't know if you noticed, but when [Martinez] went down from a vicious knockdown, he got up throwing punches. He didn't get up holding on for dear life, running around. He got up throwing punches. "That last round was an epic last round. That was as great a last round you're going to see where a guy's in trouble. It was a great last round, because what he did was, he got up and he went to war again." Unfortunately, because of Chavez's arrogance, the first 11 rounds weren't that way. Chavez thought he was smarter than his Hall of Fame trainer, his Hall of Fame father and showed disrespect for Martinez by not putting everything he had into his camp. For most of the first 11 rounds, he simply followed Martinez around, failing to cut off the ring and get Martinez into a tight space where he might have been able to accomplish something. Martinez used the old one-two combination, the most basic in boxing, over and over and over again. Martinez landed 140 jabs in the fight according to CompuBox; Chavez landed just 178 punches. Martinez had wide advantages in punches thrown (908-390), total punches landed (322-178) and jabs landed (140-49). All those numbers were built up despite a 37-8 Chavez edge in power punches landed in the final round. "It was working and so why stop?" Martinez said. "There was no reason to do so." Martinez's speed was also a huge factor, Roach said. Chavez attributed his problems to Martinez's style. "It wasn't the speed, it was the way he fought, the style," Chavez said. "It was hard to figure out and I started too late because of that." Roach, though, said that was an excuse. He said it was simply a matter of Chavez failing to put in the effort. He said he had an inclination the fight might go the way it did, but he also knew that Chavez possessed that bone-rattling power that would give him a chance to win despite his less-than-stellar camp. But as Martinez was potshotting him, Roach said he nearly stopped the fight after the ninth and 10th rounds. The reason: Chavez couldn't do the things he needed to do because he didn't practice and Martinez was hitting him with hard, clean punches as a result. Roach shrugged. Though it was a virtual whitewash, he knew it was a winnable fight. Martinez looked good and there was talk of either a rematch at Cowboys Stadium or a match against Floyd Mayweather Jr. But the story of this bout was not the veteran Martinez beating up on a relatively green champion, but rather of Chavez blowing a glorious opportunity. "I showed the sport the respect it deserved, and I did that 24/7," Martinez said pointedly. He knew, as did everyone else who watched, that Chavez didn't show the sport, his trainer, his father or his opponent the respect that was deserved. The result was that he ceded his title meekly. He referred to himself several times as a warrior in the post-fight news conference, but that was laughably off-base. Warriors fight three minutes of all 12 rounds. Chavez didn't fight hard a full three minutes in any round, including the last when he nearly pulled a stunner. This should haunt him for a long, long time.